You’d never guess it, but these big toys for big boys were at the height of their design. Mechanics and team members – adorned racecars with all of those flashy stripes, logos, numbers and colors prevalent race today. A whip-fast lesson in competitive “WAR PAINT”, visual anarchy and car designs. They were to LOOK dangerous and be the WINNER. This video provides a very interesting look at the design of racing cars in 70s. The graphics on these cars are incredible — very minimal and nothing at all like the logo-plastered cars of NASCAR. Go Faster is a book by a German university professor, Sven Voelker giving the clear insight into the glory of racing-car graphic design. This book makes car fans familiar with the fact that most of the racing cars like Porsche and Ferrari were given looks not by marketing strategists or designers, but by chance. Go Faster is a collection of over one hundred examples of racecar design that documents the carefree anarchy in which they were created. In the book, each colorful racing car is featured next to a blank, white model. Thanks to this juxtaposition, Go Faster shows its readers exactly how graphics modulate the look of the vehicle. The neutral models also give readers ample opportunity to imagine their own possibilities for graphic design in motor sports. This makes the book an ideal gift for anyone interested in racing and high speeds. Stripes, numbers, colors, and logos – the graphic visual look of a racecar has to stand out from all the others as they go zooming by. Most people don’t know that racing cars from the likes of Porsche, Ferrari, Maserati, and Lotus were given their looks not by marketing strategists or designers, but by pure chance. Go Faster is a collection of over one hundred examples of racecar design that documents the carefree anarchy in which they were created. In the book, colorful racing cars are featured next to blank, white models. Thanks to this juxtaposition, Go Faster not only takes its readers on a breakneck ride through images of racing history, but also shows them exactly how the graphics modulate the look of the vehicle. The neutral models in the book also give readers ample opportunity to imagine their own possibilities for graphic design in motor sports. The time and effort invested in the look of racecars is strangely out of balance compared to that used to shape the bodywork or engineer the technology present in the car. But perhaps it is precisely this amateur quality, this anarchy and randomness that results in the irresistible attraction that racing cars and their graphics have on us. There are, of course, countless books on racing cars, but Go Faster is the first to focus on the graphic design of these machines. is a car enthusiast and graphic designer in Berlin. He is responsible for the global corporate design of the Suzuki Motor Corporation and other clients. This book with 144 pages and 21 × 26cm format was release on January 2010 and is priced at $ 40, 00. The book is the collection of more than hundred examples on race car design, documenting the carefree anarchy which these vehicles were created in. 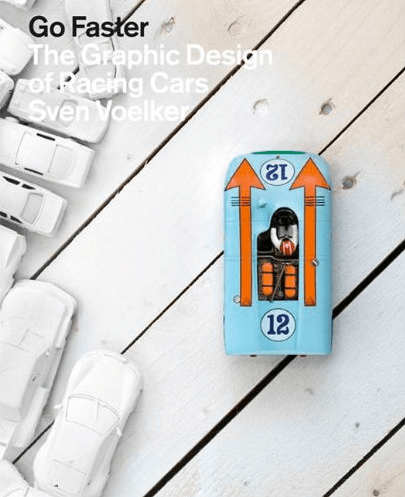 At the same time, the book not only gives the readers a chance to know how graphics modulate the look of the vehicle but also the opportunities to imagine their own possibilities for graphic design in motor sports. Go Faster gives meticulous attention to minutest details and discusses how the numbers, stripes, logos and colours in vehicle are not a willy nilly affair but purposefully placed by the designer team. Well, this book comes out to be a perfect gift for the racing nerds and car freaks. While the go-faster stripe is a classic design element of the racing car, the look of these vehicles is rarely created by a designer. Sven Voelker looks at the unexplored area of fast and furious graphic art in the new book,……. This is the excellent blog for anybody who would like to know about this subject. You know so significantly its virtually difficult to argue with you (not that I genuinely would want…HaHa). You certainly set a new spin on a topic thats been written about for years. Fantastic stuff, just great!